Located in Listowel, County Kerry, the Lartigue Monorail offers visitors of all ages the opportunity to experience a unique form of rail travel. The original steam-powered monorail (designed by Frenchman Charles Lartigue) ran for nine miles between Listowel and the seaside resort of Ballybunion. 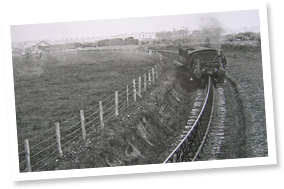 Operating from 1888 to 1924, it carried passengers, livestock and freight along a rail supported on A-shaped trestles. It occupies a special place in railway history as the only monorail of its type to operate successfully on a commercial basis. During its lifetime, the original Lartigue Monorail was an object of much interest, curiosity and amusement. 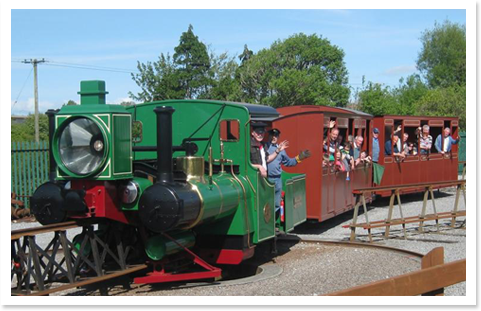 Nowadays, your visit includes a short demonstration journey on a full-scale diesel-powered replica of the original monorail. During the journey you will experience the unique features of the monorail and will observe its ingenious switching system. 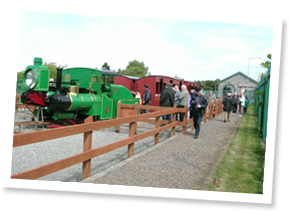 Before or after your journey, you can visit the Lartigue Museum to watch film of the original Lartigue and see models, displays and memorabilia of the Lartigue and main-line railways. The friendly staff, consisting mainly of volunteers, will be on hand to provide information and answer your questions. * Special opening can be arranged for groups, by prior arrangement. Listowel is a picturesque small market town in north Kerry in the south-west of Ireland. As well as the Lartigue Monorail, the town also has the Kerry Writers Museum, Listowel Castle, Town Park and river Walk and many friendly pubs, cafes and restaurants. Amongst the other attractions in the north Kerry area are the impressive Crag Cave and the fine beaches and cliff walks of Ballybunion.